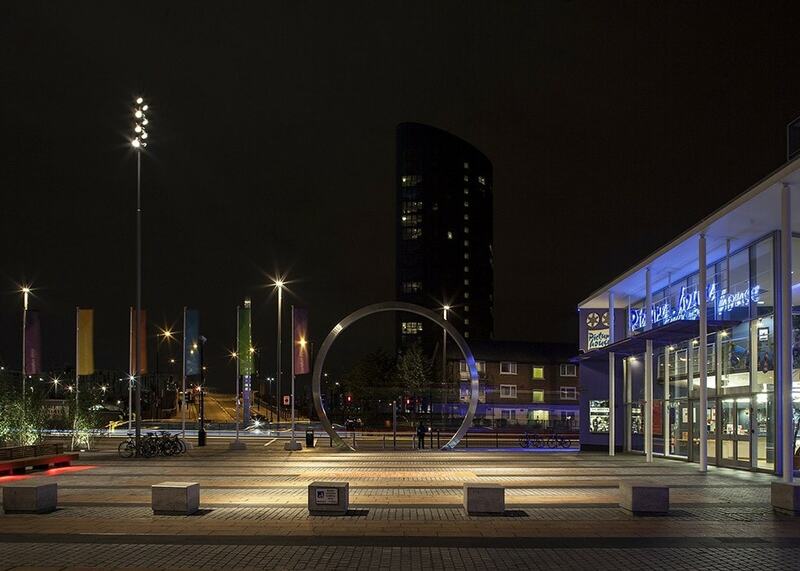 In the run up to the 2012 London Olympics, LAPD worked with Studio Egret West to illuminate Stratford Centre connecting it to the new Olympic development area and also the new Stratford Westfield shopping centre. The primary focus of the project was at the rear elevation of the Stratford Centre shopping centre. The project faced Westfield Stratford and the Olympic park. The architect envisaged a grand sculptural installation, wrapping this view in what became the ‘Stratford Shoal’. 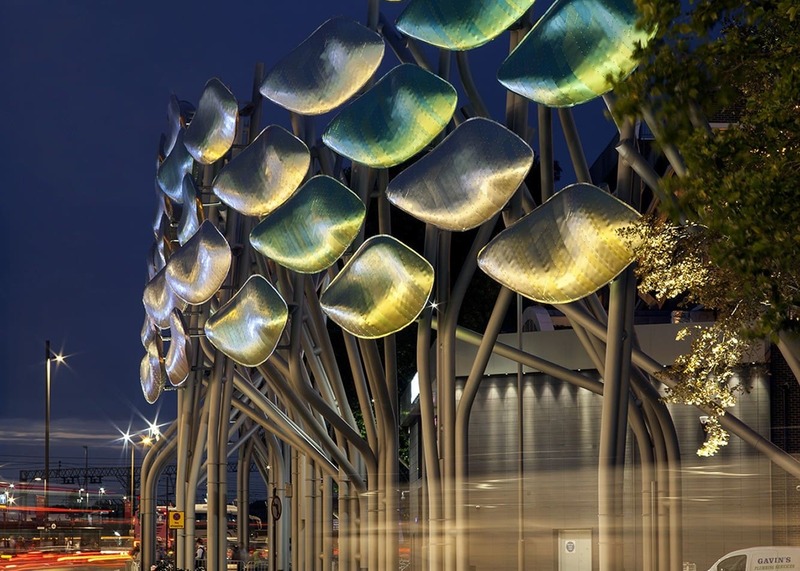 The leaves of the Shoal were a series of modular forms clad in anodised titanium. Able to move with the wind, they therefore created a dynamic and shimmering kinetic sculpture. LAPD illuminated this kinetic sculpture from below with narrow beam ground-recessed LED projectors. At night the titanium leaves and their riveted, layered surfaces reflected this light, emphasising their sculptural form and movement. 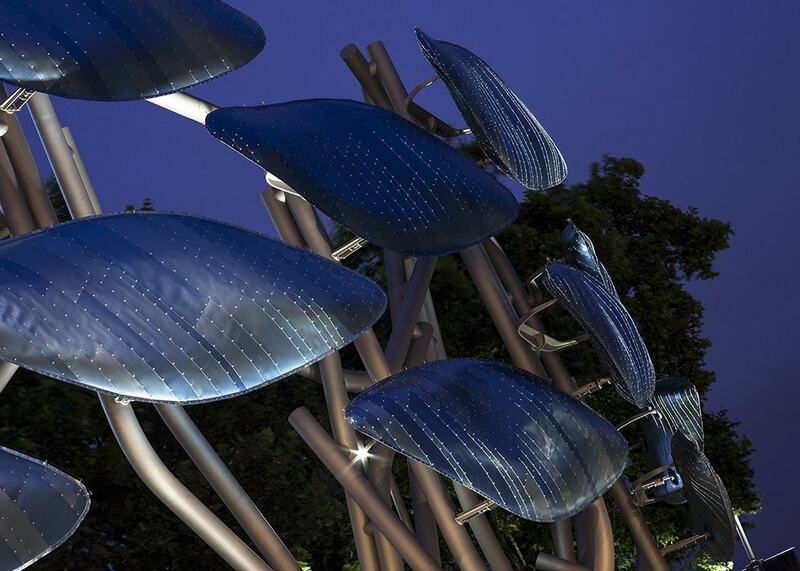 Each leaf of the shoal featured anodised, gradated colours, creating a spectrum of colour across the complete installation. Together with the reflected light, the effect is mesmerising. 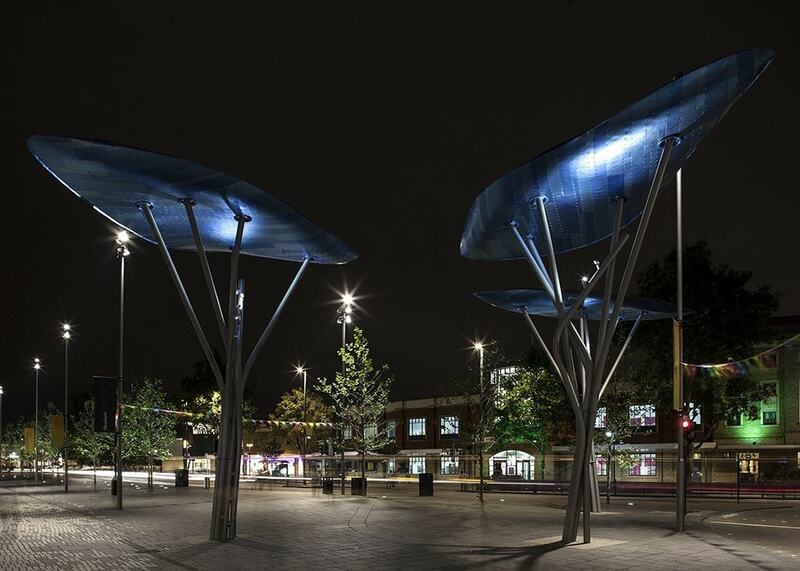 The A12 street lighting scheme used totem-like columns. These had a clean and simple luminaire head and a flat glass to minimise glare. For the Stratford Gyratory, all of the columns were intentionally installed on the outer edge of the island. This ensured uninterrupted views into Stratford. In addition, a dedicated piggyback fitting, added to each column, improved the pedestrian experience. For areas with minimal vehicular access or pedestrian access only, column-mounted multi-head LED projectors created animation without compromising safety. In addition, medium and narrow beam projectors ensured the avoidance of glare. The quality and colour temperature of the light used was a step-change to the surrounding urban environment. The use of warm colour temperature LEDs in the pedestrian environment ensured the lighting was more human-centric, and also emphasised the separation of pedestrian / vehicular space. To connect Stratford Station and the Stratford Centre, we used a homogenous, dot-free linear LED feature. Recessed within the paving, it created a crisp white line between the two spaces, therefore directing the pedestrian flow. As part of the regeneration of the area, large coloured panels mounted at 4 metres above the ground provide shade and identity to Stratford Market. To ensure that these also created a benefit at night, integral LED lighting made the colours pop and emphasised the energy of the space. With the exception of the road lighting, the specification of which was pre-determined by the Highways Agency, the entirety of our work at Stratford is LED-driven. This ensured that the London Borough of Newham received not only a regenerative and artistic boost, but an easy-to-maintain one.